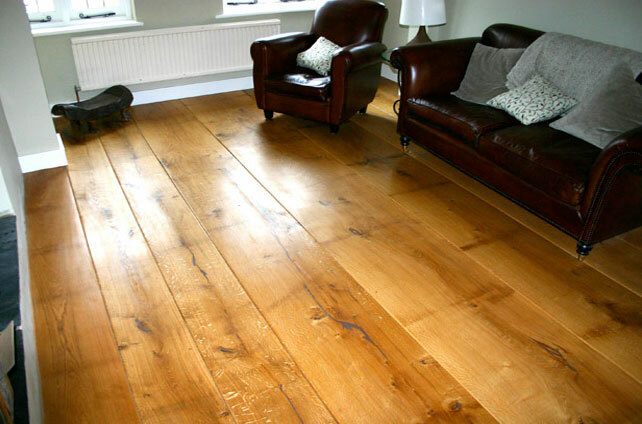 Hand worked wide boards, these boards are 30mm thick up to 900mm wide, & 15meters in length. They are very unique full of natural character and are a special order only. They are a joy to work on and we truly value and treasure the opportunity to be able to produce such extraordinary floors out of them. The boards are not flat but have beautiful undulations that follow the natural lumps and bumps in the timber, they have a really special feel to them. We fit and finish these floors in a range of finishes, you will not find floors produced in the same way anywhere on earth. Wide boards can and have been successfully fitted over underfloor heating, fitted skirting to skirting without head joints. These truly unique floors are made to last using traditional fitting technics, they are a serious investment not for the fainthearted, but a client that wants to be bold and invest in something that not only has the wow factor but has a truly solid and remarkable feel.